Two community members experienced watching their son and daughter-in-law struggle when they lost their newborn son as a stillborn. It was after this experience they realized how hard this was both emotionally & financially for young parents who are not only suffering an enormous emotional loss, but who are also responsible for medical and funeral costs. SO… they decided to do something about it. They approached the Uintah Basin Healthcare Foundation with the idea of creating “Brody’s Fund”, which is named after their grandson. The fund was set up in November of 2013, and this fund is now providing financial assistance for funeral and medical costs to help those who experience such a loss. If a mother (in her second or third trimester) delivers in the OB Department at UBMC and a stillbirth or a fetal demise occurs, or if an infant passes while in our hospital, the staff immediately working with the patient contacts a representative of Brody’s Fund. The family then meets with this representative and it is explained to them that a hold has been placed on all medical bills, so the bills will be directed to Brody’s Fund before going to the family. Also, this representative contacts the chosen mortuary to direct all associated funeral costs directly to the representative of Brody’s Fund. When available, funds are distributed up to $5,000 per case (max of $1500 funeral/burial costs with the remaining to cover medical costs) so that the family can properly grieve while lessening the financial stress associated with such a loss. This fund has been a blessing to over 30 families already. Keep in mind that if funds aren’t available, we cannot provide the assistance needed to these families. We are passionate about Brody’s Fund and will continue to strive to raise funds to support such a worthwhile cause. If you have questions about Brody’s Fund or you would like to make a donation, contact Maigen Zobell by emailing maigen_zobell@ubh.org or call (435) 725-2036. To make a donation, call Maigen Zobell at (435) 725-2036. Brody’s Fund is established under Uintah Basin Medical Center’s 501C-3. Did U Know? You can choose “Uintah Basin Medical Center” as your chosen charity at smile.amazon.com and a portion of what you spend will be donated to Brody’s Fund. It costs you nothing. It’s simply Amazon’s way of giving back. The “Caring for Coy” program offers care kits and burial kits with hand-made items such as blankets, outfits, jewelry, hats, diapers, bears, gowns and tuxes in small sizes so those who lose an infant (often in early stages) have beautiful items to dress their angel baby in as they hold their baby for the first time and later lay them to rest. In addition to offering care kits and burial kits, “Caring for Coy” provides a monthly support group open to parents, family and friends who are grieving such a loss. 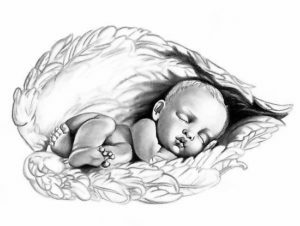 The loss of an infant is something no parent should ever have to experience, and the grieving process is difficult for all involved – parents, grandparents, siblings… Words cannot express the depth of our sorrow. We welcome you to join our monthly Caring for Coy Support Group as we meet to aid in your healing, bring hope to your future and honor your precious angel baby.